Incandescent light is given off when an object is heated until it glows. To emit white light, an object must be heated to at least 1,341°F (727°C). White-hot iron in a forge, red lava flowing down a volcano, and the red burners on an electric stove are all examples of incandescence. The most common example of incandescence is the white-hot filament in the light-bulb of an incandescent lamp. In 1802, English chemist Humphry Davy (1778–1829) demonstrated that by running electricity through a thin strip of metal, that strip could be heated to temperatures high enough so they would give off light. The strip of metal, called a filament, is resistant to the electricity flowing through it (the thinner the metal, the higher the resistance). The resistance turns the electrical energy into heat, and when the filament becomes white-hot, it gives off light. It incandesces because of the heat. This is the basic principle by which all incandescent lamps work. In the decades following Davy's demonstration, other scientists and inventors tried to develop workable incandescent lamps. But these lamps were delicate, unreliable, short-lived, and expensive to operate. The lifetime was short because the filaments used would burn up in air. To combat the short lifetime, early developers used thick, low-resistance filaments, but heating them to incandescence required large electrical currents—and generating large currents was costly. In 1860, English chemist and physicist Joseph Wilson Swan (1828–1914) invented a primitive electric lamp using a filament of carbonized paper in a vacuum glass bulb. In Swan's time, however, it was impossible to make a good enough vacuum. As a result, a wire might be brought to incandescence and produce light for a short time, but it quickly burned up and the light went out. Although the lack of a good vacuum prevented the lamp from working very well, Swan's design helped American inventor Thomas Alva Edison (1847–1931) produce the first practical incandescent lightbulb almost twenty years later. Electricity: A form of energy caused by the presence of electrical charges in matter. Filament: The light source or part of an incandescent lightbulb that is heated until it becomes incandescent. Incandescence: Glowing due to heat. Resistance: Anything that causes an opposition to the flow of electricity through a circuit. An important key to Edison's success was that much better vacuums were available by the late 1870s. 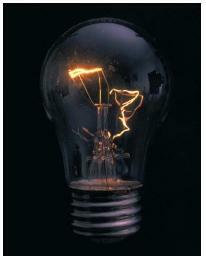 In addition, Edison knew that the lamp filament should have high, rather than low, resistance. By increasing the resistance, one can reduce the amount of current needed. Increasing the resistance also reduces the amount of energy required to heat the filament to incandescence. After spending fifty thousand dollars in one year's worth of experiments in search of some sort of wire that could be heated to incandescence by an electric current, Edison finally abandoned metal altogether. He then discovered a material that warmed to white heat in a vacuum without melting, evaporating, or breaking—a simple piece of charred cotton thread. On October 21, 1879, Edison first demonstrated in public an incandescent lightbulb—made with his charred cotton thread—that burned continuously for forty hours. Modern incandescent lamps come in a huge variety of shapes and sizes, but all share the same basic elements. Each is contained by a glass or quartz sphere or envelope. A current enters the lamp through a conductor in an airtight joint or joints. Wires carry the current to the filament, which is held up and away from the bulb by support wires. Changes in the specifics of incandescent lamps have been made to increase efficiency, lifetime, and ease of manufacture. Although the first common electric lamps were incandescent, many lamps used today are not: Fluorescent lamps, neon signs, and glow-discharge lamps, for example, are not incandescent. Fluorescent lamps are more energy-efficient than incandescent lamps. In the process of radiating light, an incandescent bulb also radiates a huge amount of infrared heat—far more heat than light. The purpose of a lightbulb is to generate light, so the heat is simply wasted energy. Today, filaments are made of coiled tungsten, a high-resistance material that can be drawn into a wire. It has both a high melting point of 6,120°F (3,382°C) and a low vapor pressure, which keep it from melting or evaporating too quickly. Tungsten also has a higher resistance when it is hot than when it is cold. The filament shape and length are also important to the efficiency of the lamp. Most filaments are coiled, and some are double-and triple-coiled. This allows the filament to lose less heat to the surrounding gas as well as indirectly heating other portions of the filament. Most lamps have one screw-type base, through which both wires travel to the filament. The base is cemented to the bulb. The bulb may be made from either a regular lead or lime glass or a borosilicate glass that can withstand higher temperatures. Even higher temperatures require the use of quartz, high-silica, or aluminosilicate glasses. Most bulbs are chemically etched inside to diffuse light from the filament. Placing a coating of powered white silica on the inner surface of the bulb is another method used to diffuse the light. Lower wattage bulbs have all the atmosphere pumped out, leaving a vacuum. Lights rated at 40 W or more use an inert fill gas that reduces the evaporation of the tungsten filament. Most use argon, with a small percentage of nitrogen to prevent arcing or the sparking produced when the electric current jumps across the space between the lead-in wires. Krypton is also occasionally used because it increases the efficiency of the lamp, but it is also more expensive. As the bulb ages, the tungsten evaporates. Some of the evaporated tungsten deposits on the inner surface of the bulb, darkening it. (One can tell whether a bulb has a fill gas or is a vacuum bulb by observing the blackening of an old bulb: vacuum bulbs are evenly coated, whereas gas filled bulbs show blackening concentrated at the uppermost part of the bulb.) As the tungsten evaporates, the filament becomes thinner and its resistance increases. Eventually, a thin spot in the filament causes the filament to break and the bulb "burns out." Thousands of different bulbs are available for a myriad of purposes. General service bulbs are made in ranges from 10 W to 1500 W. The higher-wattage bulbs tend to be more efficient at producing light, so it is more energy-efficient to operate one 100-W bulb than two 50-W bulbs. On the other hand, long-life bulbs (which provide longer lifetimes by reducing the filament temperature) are less efficient than regular bulbs, but they may be worth using in situations where changing the bulb is a bother or may a hazard. Spotlights and floodlights generally require accurately positioned, compact filaments. Reflectorized bulbs, such as those used for car headlights (these are tungsten-halogen bulbs) or overhead downlights (such as those used in track lighting) are made with reflectors built into the bulb: the bulb's shape along one side is designed so that a reflective coating on that inner surface shapes the light into a beam. It will give a good knowledge about incandescent lamp.If u send me the examples of gas filled filament,carbon type filament,it is better for me. needs more information on the light sources like bioluminescent,phorescent, chemiluminescent,fluorscent,incandescent. It will give excellent information about incandescent lamp.please attache the photos of parts in lamp. What are some examples of Incandescent lights? We are doing a project and I need info.